Went to ATM maybe 2 weeks ago on a weekend, widnessed awesomeness by Bimer and had an interesting chat with Mark (owner of ATM-Berlin gallery, which was opened in Dezember 2007 (if I remember correctly)) about art, streetart and life in general. So I suggest you go there to check out Bimer and have Mark put you on some list because they plan on having this kind of exhibition more often. More impressions from Bimer’s exhibition at ATM-Berlin are to be found in my Flickr set. 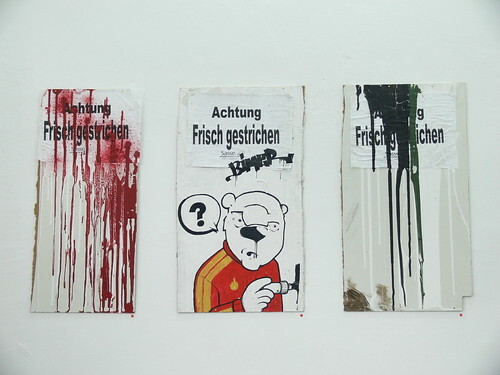 Posted in art, Berlin, streetart, stuff to do | Comments Off on Achtung, Frisch gestrichen!